Every once in a while I come across something that I call The Deal of the Day. Today was one of those days. I stopped in to my local Kroger to pick up my prescriptions and discovered the motherlode. Now, it's really kind of an interesting story. I'm standing in line at the pharmacy and glance to my right at the woman's cart next to me. I notice she has chocolate of all sorts--candy coating, chips, baker's, cocoa, etc--powdered sugar, brown sugar, Crisco, and so on. My first thought was, hm, it's after the holidays. Why is she buying all that stuff now? Then it was my turn at the pharmacy window and I forgot all about it. Until I headed toward the exit. Then I see the sign. "We bought too much" it read. And the contents of those bins were ridiculously on sale. I mean, utterly, ridiculous. So of course, I jumped into the fray. I'm a baker, okay? Here is my stash. Just take a look! And guess what I paid for it all? I mean, really. I want you to guess. Take a good hard look. Everything you see on the table. What would you think I paid? I'm waiting. Think about it. Okay, well, the total bill came to $67.71 but that was before they took the discount. Are you ready? I paid only $17.00. That's right! $17.00. Even Steven. Now, I can hear my mother in my ear saying, "It's only a good sale if you are really going to use these things." Whatever you make with that kaboodle, would love to see pics of it! Now you're reading to get started on those wine cupcakes! 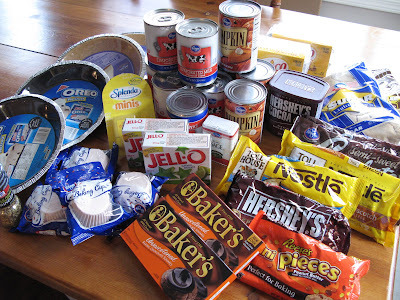 And just looking the evaporate milk makes me hungry. Am I the only one who can just open a can of that and sit down with a spoon?? LOL! Great find, Maddie, especially for a baker like you!